Keith’s obituary and guest book won’t stay online forever, and instead of paying them to keep it online, I decided to reproduce it here, along with the comments received. I was especially touched by the comment from K. Raybon of South Carolina. 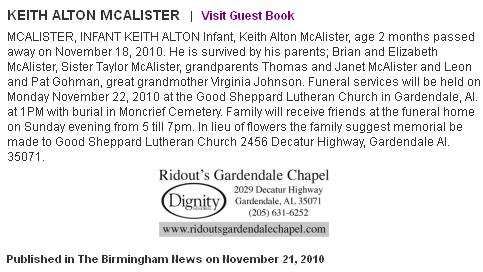 No idea who this person is, but they accidentally found Keith’s obituary and decided to leave a note anyways. I will likely never get the chance to thank this person directly, but I would tell them their stumble and 60 seconds of effort to leave a message was very much appreciated. Please know that you and your family are truly in my prayers. I’m sure so many others at St. Stephen’s feel the same way. Words of comfort simply cannot meet the magnitude of your loss, my heart goes out to you and your family. At this time of need may you rely on our Heavenly Father for that needed strength to endure. James 4:8 says Draw close to God and he will draw close to you. Know that he is always there for us in time of need. My thoughts, love, and prayers are with you and your family. angel to watch over all of you. We love all of you and Ginger. My prayers are with you for your devastating loss. May God in His time heal your wounds and at That Day make us understand the meaning of it all. I am very sorry for your loss. I pray for your family strength during this time of loss. I am truly sorry, I love you and so do our Heavely Father. If you need anything please don’t hesitate to let me know. Dear Elizabeth and family, I am so sorry for your loss. I pray the Lord walks with you and strengthen you during this difficult time. If you need anything please don’t hesitate to ask. I love you and so does the Heavenly Father. I am so sorry. I was doing a search for someone else and I ended up here. I couldn’t leave without saying that I am so sorry for your loss, and I pray that somehow you are comforted. I am just a stranger that you will probably never meet, but today my prayers are with your family.